Who is more willing to spread love than a preschooler? True story. My preschooler still tells me "Happy Mother's Day" numerous times throughout the day. True, some of these times, is to get a pack of gummies, but I'll take it. Preschoolers simply have the sweetest little souls. So who better to prepare and celebrate Valentine's Day with than them? You will adore these two Valentine's Day Books that Lu from The Mama Workshop and I have picked out. We read a lot of books as we were deciding and these two were hands down, THE BEST. A book box is a way to retell a familiar story. All the supplies needed are stored in one box. Hence, BOOK BOX. Clever, huh? Check out our very first book box here. In this particular story retell, we are pulling ideas from our world and relating it to the book read. Yes, please! Build up your preschoolers confidence for when they have to meet these rigorous standards. You will also find 50+ fun ways to learn using n our Alphabet Activity Cards. Recreate the theme of this book by talking more about "What Makes Your Heart Happy? You may also be interested in 28 Days of Kindness Activities! Simple Supply List: You only need two items! Easy Breezy Set Up for this Preschool Valentine's Book Activity! 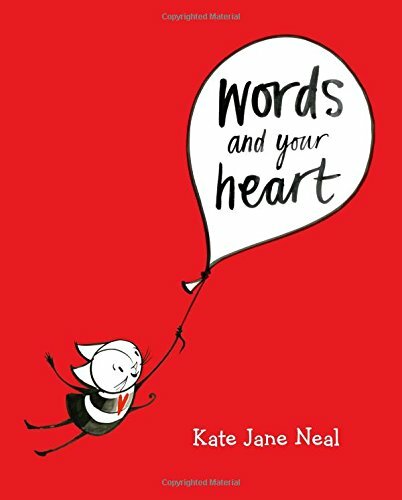 Begin reading WORDS AND YOUR HEART numerous times with your preschooler. Each time you read, and throughout the day, mention how an action made your heart happy. They will begin to catch on pretty fast. Begin to cut out paper hearts. Casually sit down with your preschooler and ask, "What makes your heart happy?". Hang up the written responses where you can continue to add and revisit. Keeping the hearts at eye level is very helpful for a preschooler. Remember to post your hearts somewhere that you can add more all throughout February. This Valentine activity will also begin to encourage more ways for being kind throuhgout the day. "Does that make your heart happy?" "Do you think that made your brother's heart happy?" "Oh, wow! My heart feels so happy after that! Thank you!" You don't want to miss what The Mama Workshop created! Join us for a preschool activity straight to your inbox every Monday and Wednesday at 7 am.